When Markarth Bannerman attacks, put two 1/1 Nord Firebrands with Charge into your hand. 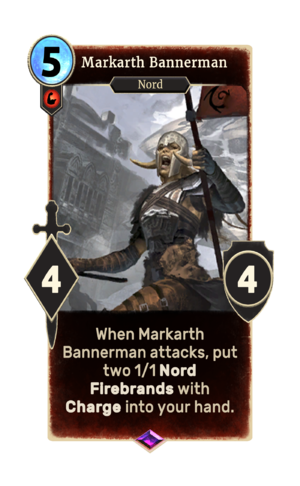 Markarth Bannerman is an epic Strength creature card. It is part of the Core Set. The card is named for the Skyrim city of Markarth. This page was last modified on 14 February 2019, at 00:08.